1. Wash salmon fillets, pat dry, set aside. 2. Line a 9×9 inch baking pan with foil. 3. Slice onion into rings and place it on the bottom of the baking pan. 4. Add salmon fillets to the baking pan on top of the onion rings. 6. Sprinkle with shredded sharp cheddar cheese, enough to cover the fillets. 7. 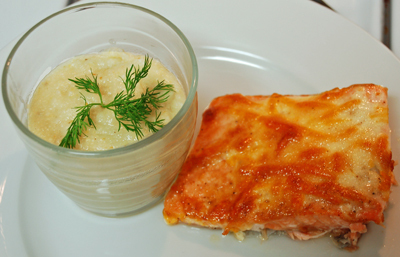 Spread mayonnaise on the fish with a spoon, enough to cover the fillets. 8. Bake at 350 degrees for 35-40 minutes, until golden brown on top and flakes with a fork. 1. In a small sauce pan, add chicken broth and bring to a boil. 2. Whisk in grits slowly, whisking well to avoid clumps from forming. 3. Reduce heat to simmer, simmer for 1 minute stirring constantly. 4. Add a splash of milk once the grits are bubbly and thick. 6. Garnish with fresh dill.